Day dreaming about the coastal beaches of Costa Rica become routine once Old Man Winter parks his tookus. Sometimes the daydreams feel so real I can practically feel the warm white sand on my feet and the cool ocean breeze on my face. During this time of year when the temps are frigid, I would do anything to sit in a hammock and sip a rum cocktail. Mr. B and I actually visited Costa Rica back in 2007 for our honeymoon. To say that we had an adventure would be an understatement. We zip lined through the trees, rappelled down waterfalls, snorkeled in the ocean, and even taught some local Costa Ricans how to play American football. But nothing prepared us for when we stayed in Puerto Viejo, Costa Rica, a sleepy surfer town located in the southernmost tip…basically Panama. The day we arrived there had been a tropical storm that had knocked out power to the ENTIRE coastline. We checked into our hotel (which was basically a hut on stilts) where Mr. B tried to calm my fears and console me as I was sobbing hysterically. That’s right about when the hotel generator went out and everything went black. I flipped the eff out! Rather than staying in our dark hotel room, Mr. B took me to the main kitchen where he knew all the staff would be. And sure enough all the staff were sitting around drinking and eating while they waited for the generator to come back on. I almost made a run for it because it kind of looked like we were entering a horror movie scene where a honeymooning couple gets murdered. Well thank goodness, Jessie (the Jamaican cook) brought out the most delicious curry crab stew. There was something about her smile and the only two things she could say….”yessss and okaaaaaay” that made me feel more at ease. 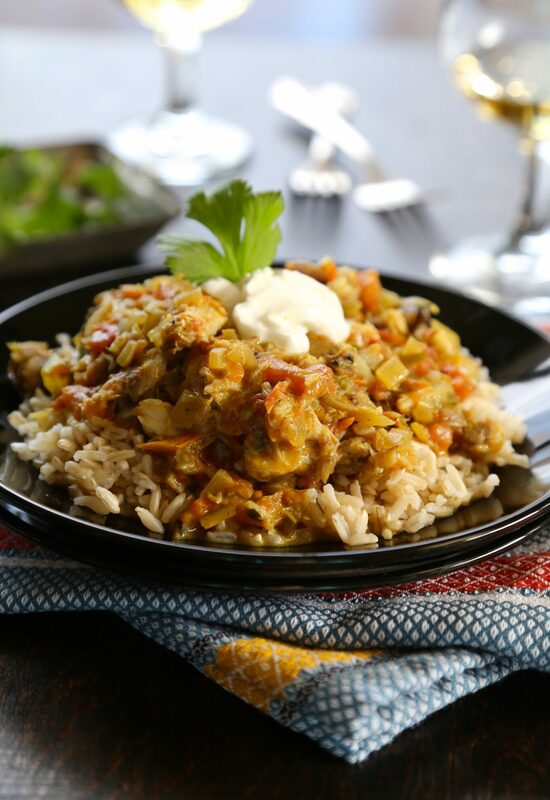 This curry crab stew is a similar version that Jessie made. 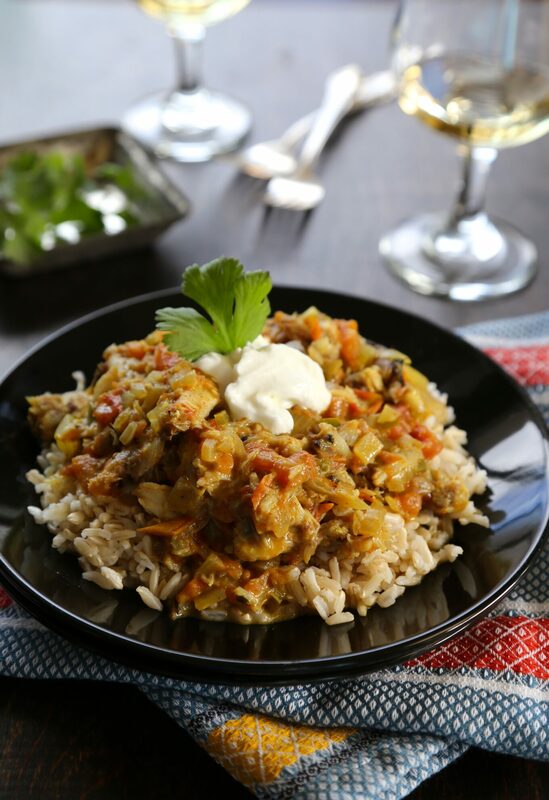 Full of spices – tumeric, curry, and allspice, veggies, chiles, and of course, lump crab. Not only will this stew warm your soul, but it will turn the lights on in any dark situation. 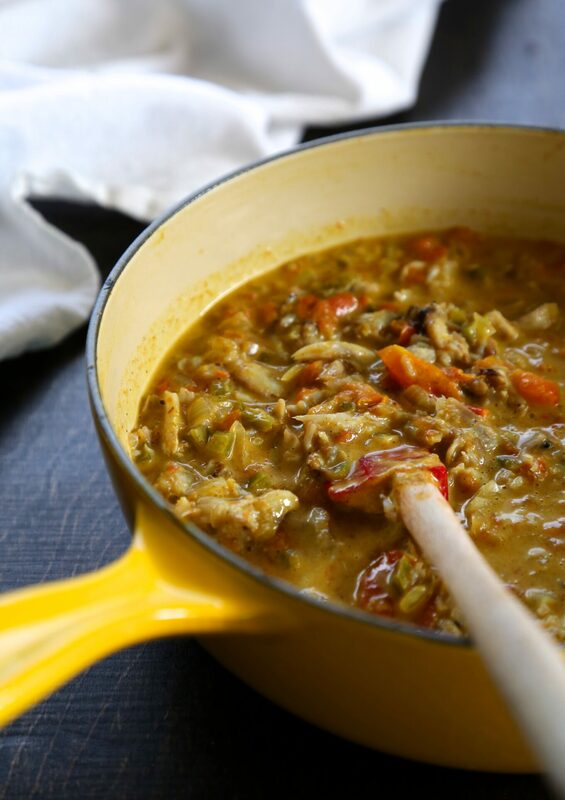 In a large Dutch oven preheated to medium-high heat, add the olive oil, onion, ginger, and a pinch of salt & pepper. Saute for a couple of minutes until the onion has softened. 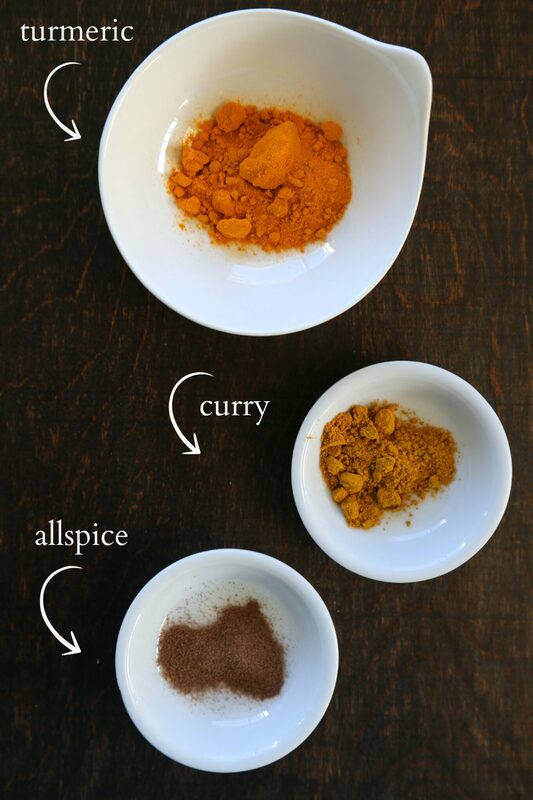 Stir in curry powder, turmeric, and allspice. Cook for another minute. Then add, tomatoes and jalapeno. Cook until the tomatoes have softened. Add the coconut milk and water. Bring to boil and then to simmer for about 15 minutes or until reduced by a 1/3. Stir in the crab and let it warm through. Ladle stew into a bowl filled with a cup of brown rice. Garnish with sour cream and cilantro.